Today teachers and students celebrate Safer Internet Day in 90 countries worldwide, and across six of the world’s seven continents. This year the theme for the day is Online rights and responsibilities, when we will encourage users to 'Connect with respect'. Whether you like to use Facebook, share photos, upload movies, blog, game, play or network, follow a few basic rules to keep yourself safe whenever and wherever you go online. This includes when you connect with your computer, your tablet, your mobile phone, and your games console. Use good ‘netiquette'. This means that you should treat others on the web as you would want to be treated yourself. Don't let yourself bully or harass someone or create a false identity. When you share stories, pictures, movies or blogs posts online that normally means that you lose control over it. The information could be there forever and will be there for anyone to see. It’s simple to post pictures and movie clips online, but do you want complete strangers to have access to your private images? Make your online profile private, and realize if you have hundreds of 'friends' then you are trusting your privacy to the integrity of people you don't know well – a risky business! Choose carefully who you talk to in private chatrooms, on your instant messaging account and on your social networking sites. If one of your online contacts, or indeed a stranger, starts bothering you with unwanted messages or bullies you online, don't put up with it! When someone sends you annoying or upsetting messages, just block them. Be careful about planning to meet people you don't really know, even if they have become your "online friends". Someone you haven't met in the real world is still a stranger. Always tell your parents or a trusted adult: Better safe than sorry! Only use your webcam with people you know and trust and always disconnect or disable it when you are not using it, so that no unwanted images are recorded. 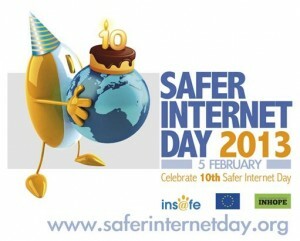 Safer Internet Day started as an initiative of the EU SafeBorders project in 2004 and was taken up by the Insafe network. Insafe comprises 30 Safer Internet Centers, one in each of the 27 EU member states as well as in Iceland, Norway and Russia. Most Safer Internet Centers are composed of an awareness center, helpline, hotline and youth panel. The helplines offer information and advice to children, young people, parents, and teachers about how to stay safe online. Hotlines are available for the public to report illegal (criminal) content on the internet in a confidential way.